“Bahrain is one of the strangest places you can go to in the Gulf,” says Kamal Rasool over our Skype interview. “There is so much weird stuff going on beneath the surface.” Kamal is one of four Bahraini members of a band called Flamingods, currently split between Dubai and London. The band returns to the Kingdom now and then to play offbeat shows, like the time they took over a water park for three consecutive weekends, playing on a platform above a pool with a wave machine. Or, the night they were booked to play an Indian restaurant, which turned out to be half-full of diners who weren’t particularly interested in the band’s kaleidoscopic, Animal Collective-on-a-spirit-quest sound. Bahrain is something of an anomaly in the Arabian Peninsula. It’s an archipelago of tiny islands (the biggest just 34 by 11 miles) ruled by a royal family. Islam is the state religion, but it’s less socially conservative than the neighboring Qatar and Saudi Arabia, which are just a few miles away over seas on either side. The fact that alcohol is legal has turned it into a party city for tourists from elsewhere in the Gulf, and the nightlife is dominated by a showy vibe. Think ladies’ nights, VIP booths, and champagne. Although small but dedicated communities of metal and psy-trance fans have flourished in Bahrain during the last decade, Kamal says that he and his bandmates used to love hearing rowdy Metallica reworkings at a Filipino metal bar called Cyclone. Most of the live music you’d see in the country until recently would be bland covers played by professional house bands. “Everybody was sick of it,” says Kamal’s brother Khalil via Skype, who lives in Bahrain. He co-founded a live music platform called Boho Baha a few years back to help a more idiosyncratic, community-minded, and local band scene grow. “We wanted people to get inspired, and get off their asses and create their own experiences,” he explains. 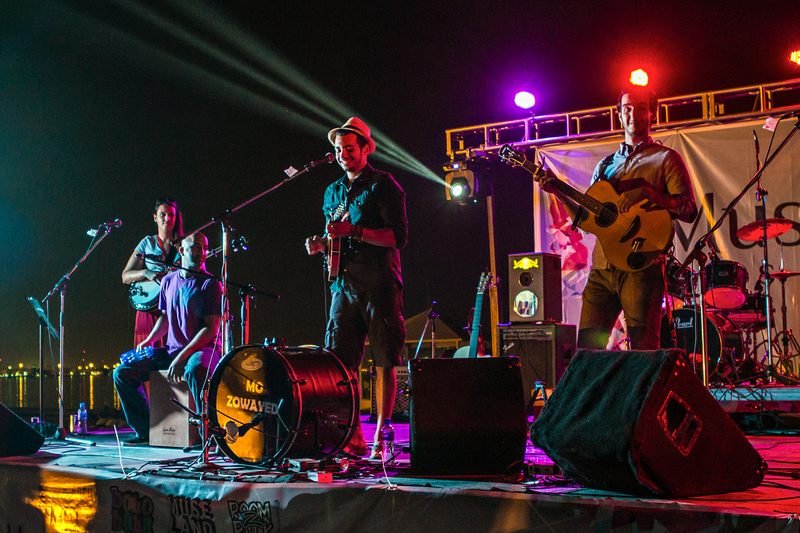 The seeds of Boho Baha were planted in 2011, when Khalil and Tarik Omar, a multi-instrumentalist and sound engineer, helped the Bahraini Ministry of Culture organize entertainment for an event at a souq to promote local stores. The duo persuaded friends to come and busk at the open-air marketplace. Other musicians, who’d previously played only in private, came out of the woodwork and asked for a spot. On the last day, Khalil and Tarik realized that they’d gathered enough bands to fill a festival line-up. Two years later, they put on the first Boho Baha: Farmfest, with a crowd of 150 picnicking during the day and dancing until dawn. The social rights activist and internet entrepreneur Esra’a Al Shafei says that she’s been recently hearing an increasing amount of Bahraini bands whose work could be described as “experimental” or “alternative.” In 2010, when she was just 24, she launched a music-streaming platform called Mideast Tunes in order to collate music from the region, which was often hard to track down. The number of Bahraini names who have uploaded songs to the service has grown to 34, and “more and more local music initiatives (not just bands) are popping up too,” she tells us by email. These include the Bahrain Music Conference, an annual trade show, educational seminar series, and festival of live performances that began in 2013; andMalja, a gallery and studio space sponsored by Red Bull that has just started hosting workshops and allowing bands to use its recording and rehearsal space. Even the long-running metal scene is evolving. Mohammed Ishaq, who plays in several groups, includingSmouldering In Forgotten, remembers the first independently organized metal gig that happened in 2003, setting of a “chain reaction” of activity. Ongoing challenges for metal musicians such as accusations of Satanism and a lack of suitable venues mean there’s still only one or two live metal gigs a year. However, artists are increasingly writing their own material and linking up with other bands in neighboring countries, like Saudi and the UAE, where Smouldering In Forgotten will play in March. “More and more people are starting to appreciate that it’s a valid form of music that promotes a positive attitude as a community,” Mohammed says in an email interview, “and not some devil-worshiping, noise-generator machine.” In the future, he hopes to establish a practice and recording space for metal bands and to put on the country’s first metal festival. Nightlife can be a bit of a bore without it.